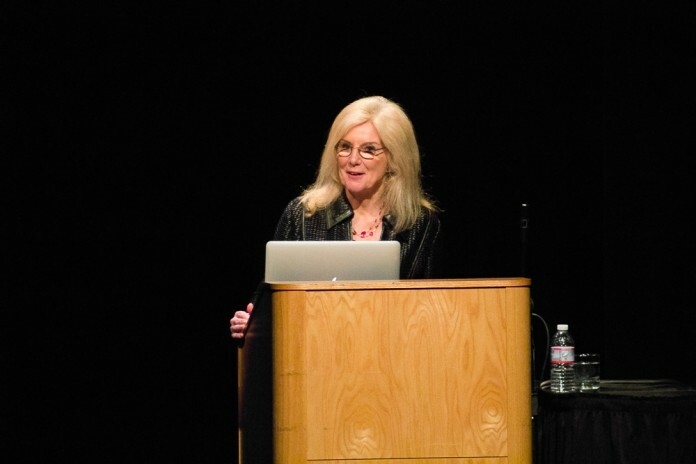 Former National Geographic photographer Jodi Cobb presented on the afternoon of Feb. 23 in the third installment of the “National Geographic Live” series by Arts & Lectures at the University of California, Santa Barbara. Almost every seat in Campbell Hall was filled, and the audience was left in wonderment and inspiration from the moment Cobb arrived onstage through the Q&A session after her presentation. Following Gore’s heartfelt introduction, Cobb walked onstage and immediately captivated the audience with her kind-spoken words and worldly experience. “I became a photographer because I wanted to change the world; it’s just been a lot harder than I thought it would be,” said Cobb. Her presentation began with a slideshow of photos from her childhood, from images of her childhood in Iran to the first photos she took herself. During her youth, Cobb travelled the world with her family, and by the age of 12 she had already been around the world twice and visited 15 countries. It was through the experiences–of meeting people from worlds entirely different from her own–that Cobb came to many realizations. “I knew earlier than most people that I didn’t know anything,” said Cobb. After receiving her Master of Arts and Bachelor of Journalism degrees from the University of Missouri, Cobb began working for a small-town newspaper in Denver, and a majority of her assignments were photographing well-known bands. She was laid off eight months after she started, and when an editor at National Geographic magazine received word, he offered her a trial position. Despite her hesitation to move from a little-known newspaper to a world-renowned magazine, the 26-year-old accepted the offer. The rest of Cobb’s presentation was focused on her most recent projects about the lives of veiled women in Saudi Arabia and Japan’s secret Geisha culture. But the most captivating story was about slavery in the 21st century. She retold her journeys through countries such as India, where children are forced to spin looms and make bracelets in dirty, poorly-lit rooms with little to no ventilation, and young girls are sold into marriage by their families. “Buying stuff cheap isn’t as nice as it used to be, because someone makes that stuff, and nothing is cheaper than a slave,” said Cobb. Because of the intensity of her past assignments, Cobb wanted to take a break and went on to travel to Venice, where she spent months photographing reflections in the water of the canals. “In the end, maybe I didn’t change the world, but the world changed me profoundly and irrevocably,” said Cobb. Currently, Cobb is going through photographs from over 35 years ago for her retrospective autobiographical book. Her other collections are available for purchase.